How to Draw a Roller Coaster. Roller coasters are fun to ride, and they are just as fun to draw. To draw a roller coaster, all you need is a pencil and paper. Follow these steps, and you'll be able to draw a roller coaster that every amusement park will envy. Prepare your paper. Place your paper horizontally. Make two small vertical lines, one near each of the right and left edges of the paper. These lines will help you keep your roller coaster design on the page. Now draw small horizontal lines at the top of the paper and in the middle of the paper. All of your tracks will need to be between these lines. Begin by drawing the roller coaster's loading station. The loading station is the place where the roller coaster train stops to let on passengers. To make a loading station, draw a small rectangle that is longer than it is tall on the left side of your paper. Draw the track. Start at the loading station and draw a line that will be the path of your roller coaster. If you draw a sloped line that goes upward, your roller coaster will go higher. If you draw a circle, your roller coaster will go upside down. Keep your pencil on the paper, and make your path go from the left side of the paper to the right side. When you get to the right edge, move upward, and head toward the left. The roller coaster should end at the back of the loading station. Finish drawing the track. You know that a roller coaster track as two rails. Wheels from the roller coaster cars move along both rails of the track. Now that your track's path is laid out, you'll need to draw the second rail of the track. To do this, start at the loading station and draw a line that is parallel to the path you made in Step 3. Add the supports to your roller coaster. Your track will be supported by vertical beams and cross beams. To make vertical beams, draw evenly spaced lined connecting the track to ground. Make cross beams by drawing "x" shapes between neighboring vertical lines. Put your roller coaster train on the tracks. 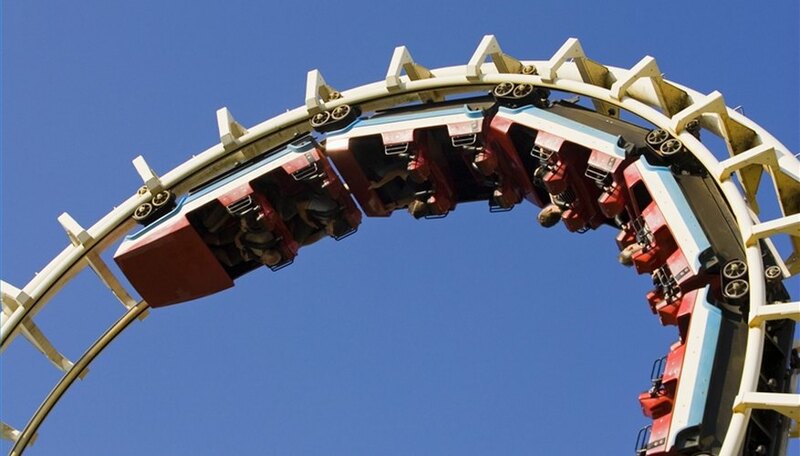 A roller coaster train is simply two or three small rectangles next to one another. Put a train anywhere on the track of your roller coaster. If you want, you can even draw people in the roller coaster cars. How do I Make a 72 Inch Tower From Paper?